Poppy and Harry hosted their wedding at Rock Village Hall in Bewdley. The couple were legally married the weekend before, at Malvern Registry Office, but the couple really wanted to ensure that their big day was done their way. Poppy had said she'd always wanted to get married outside and under a giant oak tree, and Rock Village Hall was the venue that they chose for this. The couple really made sure that they put their own stamp on the wedding by making the vast majority of their wedding decorations themselves. This included the arch under which they had their ceremony as well as the dressing of Rock Village Hall itself. 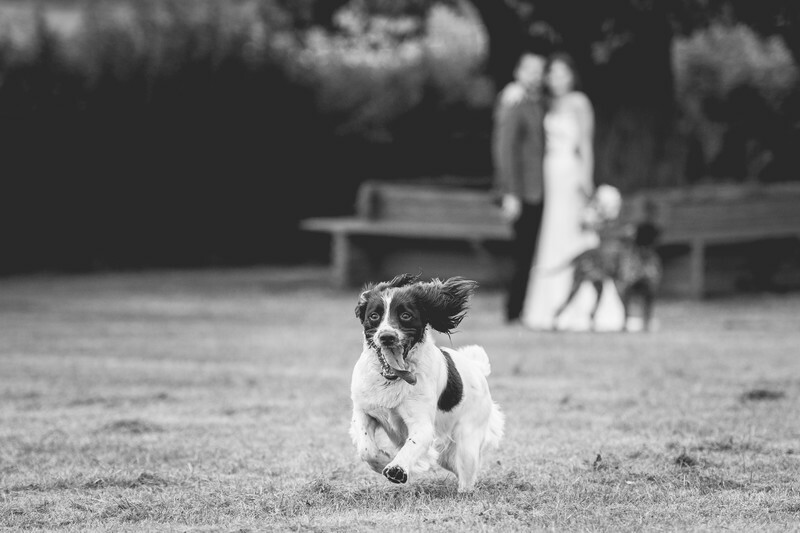 This is one of my favourite wedding photos from the day, with the couple's English Springer Spaniel stealing the show. We were talking a walk around the venue for some photos after the wedding, when one of the guests threw the dog's ball past me. Without warning, the dog took off at full speed. I dropped to one knee to make sure I could frame the image with the bride and groom in the background (to ensure it's a wedding photo and not just a photo of a dog) and fired off about 20 shots. The camera gear that I use is so good at things like this, that every photo from the series was in focus making it hard to choose the best individual image. Location: Rock Village Hall, Bewdley, Kidderminster.